Welcome to Day #6 of Chocolate and Banana Theme Week. I occasionally mix cereals together to create new flavor combinations. Happily, Living Intentions (Point Richmond, CA) offered both a Cacao and a Banana cereal as part of their Activated Superfood* line, that I thought might be suitable for mixing. 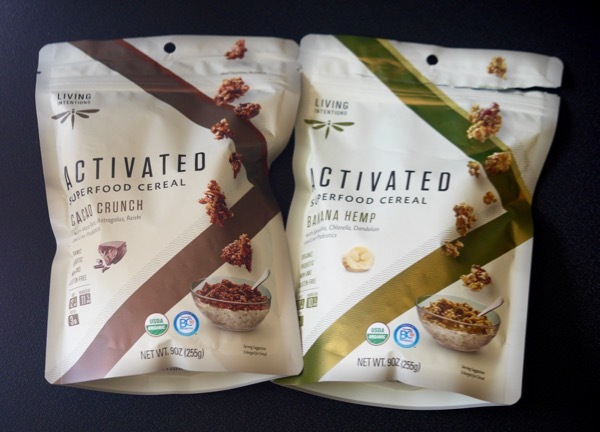 Today I tried both the Cacao Crunch Activated Superfood Cereal and the Banana Hemp Superfood Cereal from Living Intentions. 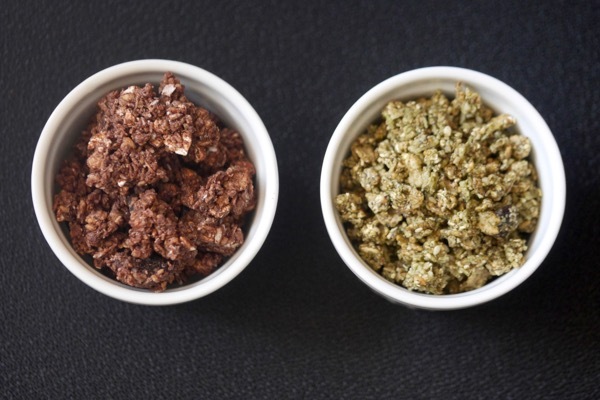 Both were organic, probiotic, buckwheat-based and gluten-free cereal alternatives with several inclusions. 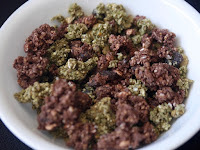 The list of added herbs (+ cacao) and/or greens making these cereals "super" was so impressive I thought I might explode from healthiness...or transform into a super hero. I wasn't sure which. Fortunately, I had nothing to fear. Each of these flavors was very lightly sweetened (not overly sweet—thank you!) and had a pleasant taste and texture. These had just the right amount of crunch (not too firm, not too crumbly) and were enjoyable plain, or with milk of choice. The Cacao Crunch was cocoa colored and had a mild cacao almost malty flavor and a satisfying crunch. The Banana Hemp had a light beige-green tinge, contained naturally sweet raisins (sultanas) and had a very subtle banana flavor. And the two blended very nicely together in one bowl. *Superfoods are generally edible items that contain beneficial nutritional properties, such as high levels of anti-oxidants and/or vitamins/minerals. "Activated" was defined by the company as food that is at "its highest nutritional potential." For example, a combination or organic, sprouted ingredients and added "CFUs (colony forming units) of friendly probiotic cultures (that support friendly bacteria and yeasts)"..."to support immune health and start your day off right." The Cacao Crunch cereal contained maca root, astragulus, reishi and live probiotics. 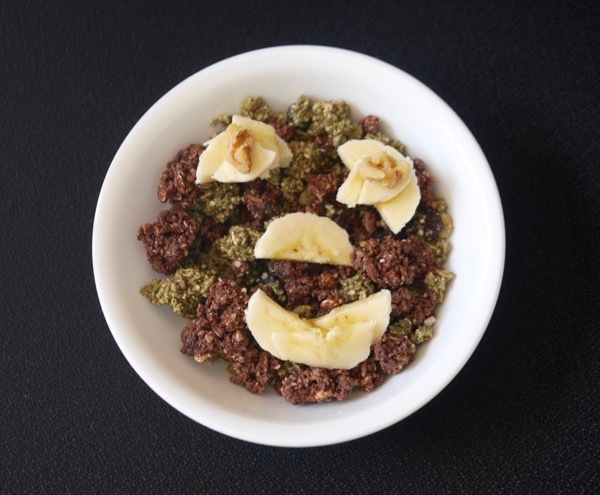 The Banana Hemp cereal contained spirulina, chlorella, dandelion and live probiotics.